Rohan Nathan didn't want his picture taken for this profile. He didn’t even want this to be about him, after helping recreate the City of Brampton’s new council chambers, where our elected officials plot the course of our collective future. In a world already drunk with selfies and self-regard and where a U.S. president has redefined the word narcissistic, Nathan is a blessed throwback, the epitome of self-effacement – a perfect portraiture of the behind-the-scenes man. During his entire work career, which tumbles back into the 1970s, he has been the invisible hand that has guided many businesses and public sector organizations in Brampton, and right across southern Ontario. R. Nathan & Associates, Innovation and Technology Consultants is one of the oldest and most influential small businesses in the city’s history. But its principal consultant is virtually an invisible man – which suits him just fine. 1. A profile isn’t really a profile unless it talks about its subject. 2. This story might make you feel uncomfortable, but it might be of interest to others. 3. Your purpose-driven life is a composite drawing of the immigrant experience – you’re a model for all. Nathan hummed and hawed but finally gave in and gave the go-ahead earlier this week as he sat in the back of council chambers monitoring a budget committee meeting. It was decided that the interview would be done over the phone on Thursday when he had more time. The refurbished City Council chamber which recently reopened for use. The call started badly. His car was broken and it needed fixing and he had an appointment with his mechanic, and besides, he needed to talk to some higher ups at city hall to get permission so he could yap. And so, it began, a half-hour of back-and-forth chatter that extended out to an hour – and then fifteen minutes more, and fifteen minutes more after that. What started out as a short profile, was now moving into War & Peace territory. It covered the entire expanse of his life. Childhood: He was the son of immigrant parents from Sri Lanka who moved to the Peel Village home of his older brother Raj (a policeman with Halton Region) in the 1960s when the city population was 38,000, and its demographic mix was 37,990 pearly white hosers who loved Leafs’ hockey and donuts. Work life, Part 1: He got into the AV (audio visual) business after graduating from the University of Toronto and remembers it as a “bang and hang” business, replete with drop screens and overhead projectors and rudimentary presentations in halls and boardrooms. Work life (Part 2): Then it started to change, so quickly he could hardly keep up. First came computers and Power Point presentations and then multi-use video projection. Family: He and his wife, Marni, have lived in their Brampton home for 45+ years, and they have two daughters (teacher and doctor). Influencers: His father owned a movie theatre back home and he thinks that might have been what attracted him into the AV business. He loved his parents who embraced being Canadians and thought it important to keep their roots, but integrate, not segregate. His father also left him with a message he retains to this day. He wrote down one word: think. But it was written like this… THINK! Before you do anything in life, THINK! Yes, THINK! how your actions are going to impact on you and others. THINK! how being positive will rub off on others. If you’re negative, THINK! how others will see you. Work life (Part 3): Welcome to the world of digital and web streaming. Today, everything is about creating networks that link users and fuel efficiencies and keep costs low. In 2017, the city introduced web streaming for its council and other meetings and in 2018 it moved out of the aging council chambers, temporarily, to set up shop across George St. so it could revamp its facilities. It took four months, while the online streaming never missed a beat in connecting web users with what elected council members were up to during the public sessions of the local legislature. 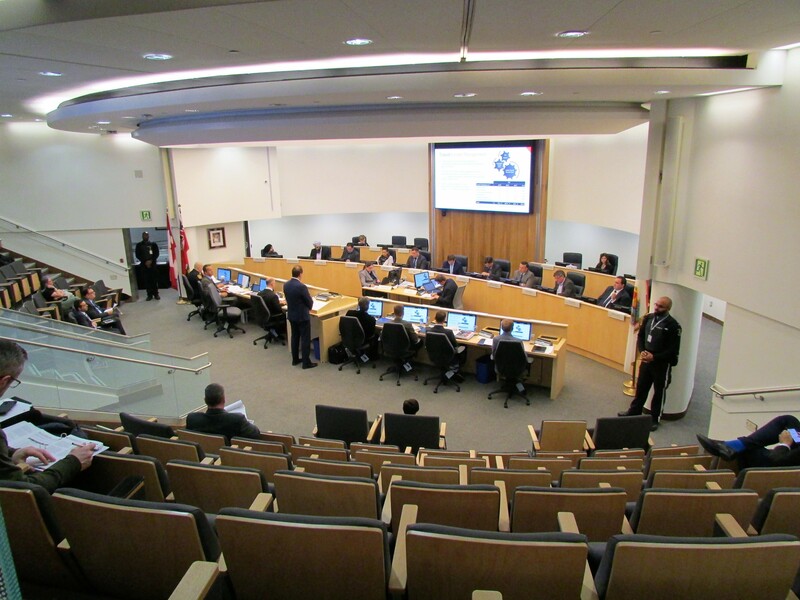 The design team hired to implement changes completed work recently, and the new council chamber is a modern-day marvel of sights and sounds and digital feeds. Nathan says the design teams have done a great job, and the city’s information technology department team under Katherine Kulson should be lauded, along with others, like Cindy Binnell, director of internal design services and her team. It all falls under Joe Pittari, the interim chief administrative officer. The idea is to create a seamless network of services that gives citizens a direct connection to the democratic process underpinning our lives in a city that works for us. 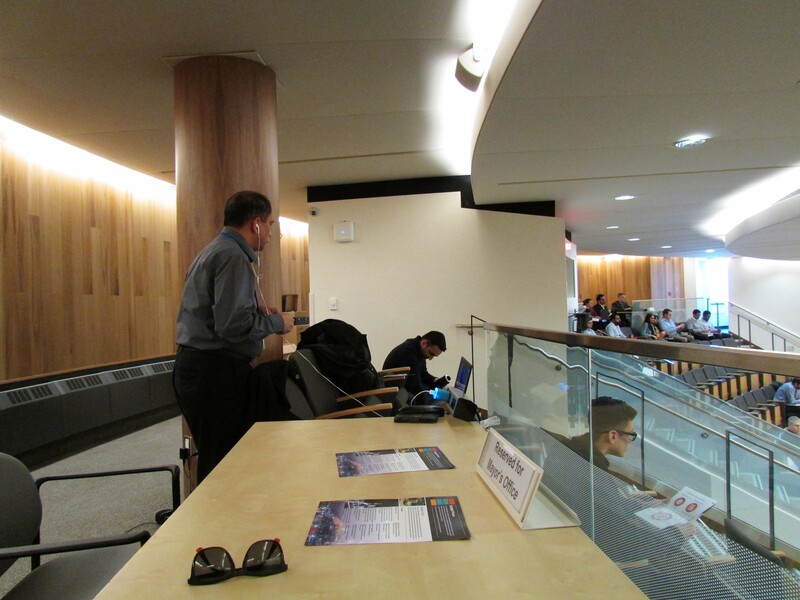 Work life, Part 4: When the City of Vaughn went looking for someone to draw together all the elements for an integrated network to serve its brand-new atrium, council chambers, offices, etc., they called on Nathan to consult. The work is 99 percent done, and it’s a state-of-the-art marvel. While Vaughn’s council meetings are now run through a single laptop or tablet, Brampton is getting there – still pushing a few buttons, but on the road to dramatic change, after more than a decade of lagging far behind the technological innovations that keep companies in the private sector connected globally, at the speed of light (almost). Nathan is particularly proud of the ‘Cannabis Town Hall’ that was held in the atrium at city hall earlier this year. It was an interactive, live-streamed event that drew a big online audience. It not only ran on the city website, but was streamed live on Facebook, too – a first for the city. So, what’s the future? Nathan foresees more community collaboration and even the possibility that councillors who are off-site can still interact with colleagues and the public through remote feeds. The networking potential at city hall, a place that screams to be connected, is virtually unstoppable. It’s been said that sunshine is the best disinfectant, and if that’s true, then Nathan’s cleans out every room at city hall, especially council chambers. He loved the fact new councillor Charmaine Williams came up to him only weeks after she had been on the job and commented on his smile, and how he always seems to be around to bring good cheer to council chambers. It made him THINK back to his father’s advice. Nathan has lived and worked through four mayors, starting with Peter Robertson in the 1990s and running in a linear line through Susan Fennell, Linda Jeffrey and now Patrick Brown, a big fan of innovation and new ways of doing things in general. 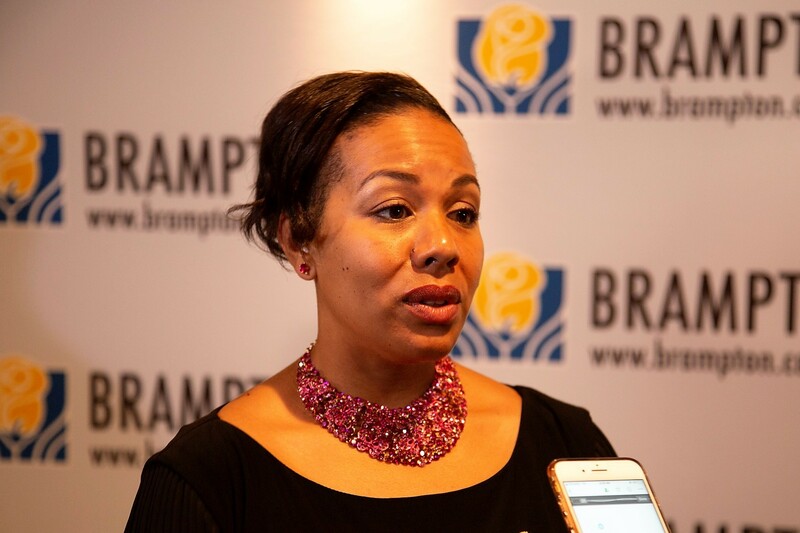 He likes the current council makeup, and the professionalism of the city staff, and he says it’s no wonder Brampton is quickly reaching “Smart City” status. It isn’t a surprise Brampton recently hosted the ITAC Smart Cities Technology Summit at the Rose Theatre. Pittari welcomed participants by saying Brampton is proud to sit in the centre of the Toronto-Waterloo Innovation Corridor. The Rose City is perfectly poised to make Smart City ideals the keystone of its future. Nathan is thrilled with the new council digs, with its high-tech add-ons that make it easier to access information and project ideas back to the public that are brought vividly to life, live or through online streaming. While the council chambers were being re-done, it shifted over to another room in the West Tower building on George Street, it was important to keep the quality of production high. In days of yore, when Nathan was new to the city and so was a new company called Rogers Cable, he would get to meet its founder, Ted Rogers. It was Rogers who personally congratulated him on the 25th anniversary of his volunteering with the company. Nathan was a pioneer in bringing council meetings to the public via Cable 10 Brampton. Mobile trucks and cameras at council and running feeds through cable to get the picture out to the public, seems like ancient days now, but it was only 2017 when Rogers shut down its station and stopped broadcasting to the public. Nathan is proud to have been a part of that past, and even more thrilled to continue his association with the city presently and into the future, stepping up to fill in where Rogers left off. It might have been a blessing in disguise. The infrastructure is finally catching up to the technology. Nathan is still as picky about the product being produced as ever, and the web streaming of meetings has to be flawless. Hundreds (occasionally thousands) of people watch these broadcasts, and from his monitor at the back of the chambers, he makes sure everything is just so. He may be invisible to some, and has enjoyed going “incognito,” over his many years, but the truth is, his work has been front and centre and has reached out and touched thousands of Bramptonians – and it will continue to do so well into the future. That smile hasn’t changed much over the years – a wide and broad one. It’s well known to the politicians and staffers at city hall. Rohan Nathan didn't want a profile picture taken, so this is the best we could do. For the good-natured Brampton resident, it’s been a “labour of love.” The tech buzzwords have changed over the years, but the work really hasn’t. It’s all offering accessibility to clients and residents. In this case, bringing democracy to life. The interview is finally over. During our talk, his voice kept rising like the notes on a musical scale. He loved rhapsodizing about Brampton and how much it has meant to him and his family to have lived here. He’s glad he has played even a small part in making it a modern city. Now, he says, it’s time to fade into the background. That’s where he’s most comfortable. He’ll settle back into his place behind his monitor in the high back corner of council chambers, making sure the sound and picture is perfect before it’s streamed out to the public. While he’s doing that, a camera is pulled out, and stealthily gets a few pictures. They’re not great, but they’ll have to do for this profile.